Gary and his Polaris RZR, a side-by-side two-seater. I have one similar, but left mine at home. They’re amazing little vehicles. 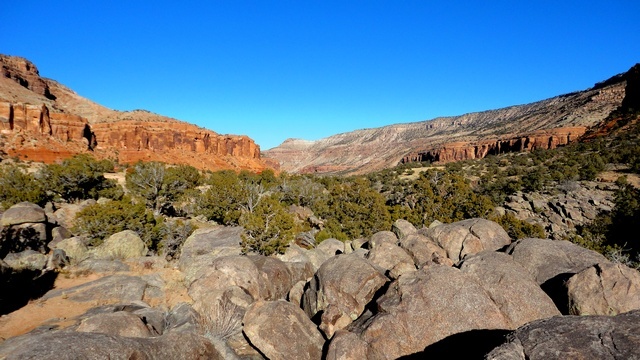 Escalante Canyon is named after a famous participant in the Dominguez-Escalante expedition which took place about 1750. The idea was to find a route from New Mexico to California. They never made it that far, but they did get through what is now western Colorado and on into Utah. Silvestre Vélez de Escalante did keep excellent journals, however, and people have tried to reconstruct the expedition’s route through this part of Colorado. It is thought that they might, maybe, perhaps, possibly, potentially have made their way through what is now called Escalante Canyon. In any event, it’s a pretty place, even in late Fall. 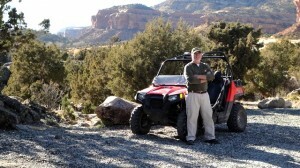 Gary and I hopped into his Polaris RZR for a trip up Escalante Canyon on Tuesday, November 12th, 2013. The GPS track is found at the bottom of this post. The road is accessed west of Delta, Colorado, on US Hwy 50. The turnoff is marked with a sign saying “Escalante Canyon.” There’s a large parking area just off the highway where you can park your trailer. Actually, the canyon road is in great shape, and any vehicle can make it almost as far as we did, which was just shy of the Uncompahgre National Forest boundary. 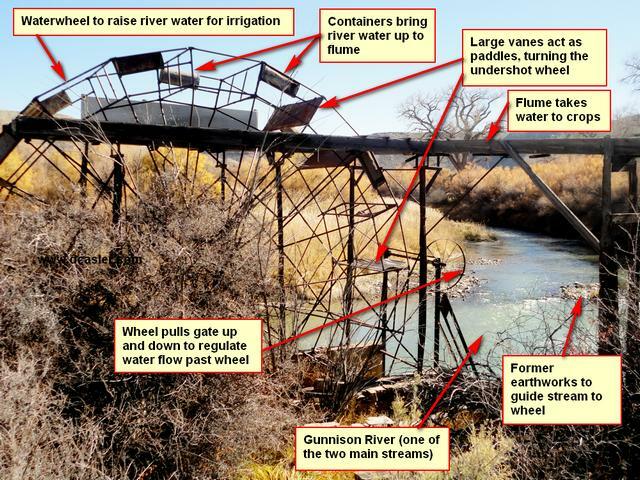 The side trip to the water wheel is an entirely different matter. Just after crossing the Gunnison River, and I do mean just after, an ATV track leads off to the southeast, hard along the river. We could see the railroad tracks on the other side. The track we followed, much overgrown though obviously traveled with some regularity (the ice on the puddles was already broken), led to an old water wheel irrigation works. The wheel was constructed so that the power of the river itself lifted water up into a flume. Being an engineer (albeit now retired), I crawled all over the thing to figure out how it worked. It’s not operational, and given that a large bush is growing up through the middle of it, it hasn’t been in some time. But I didn’t leave until I was satisfied I knew how it worked and how river water was diverted to run it. See the annotated photo. Water, of course, means crops, and crops means a farmer. So Gary and I scrambled around, playing amateur archaeologist, and followed the course the water must have taken. It led to a flat area about two or three acres just downriver. A farmer means a house, so we looked around for the foundations of a cabin of some sort, but what we found instead was a dugout. I must say, as a thoroughly-spoiled modern American, the life this poor farmer led was nothing short of primitive. Here’s the photo looking in the door. Note that I did not step inside—as it looked far too dangerous. Dugout found near the water wheel near the fields the water irrigated. The rear wall of the dugout has collapsed. It looks like it must’ve flooded and poured mud into the dugout. The dugout’s walls are flat stones with mud mortar. 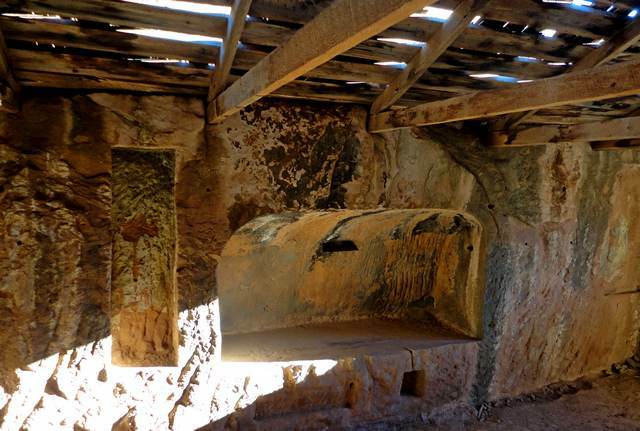 The main roof beam seen to the right in the picture is the main roof support—it rested upon the front and rear walls. The cross beams are smaller branches. Above this, not shown, is a layer of brush, with the twigs all carefully laid in the same direction. And then above this is just plain dirt, which in this case is quite pebbly and sandy. The door, seen in the left of the photo, has its base buried in silt, which may have come from the same flood that broke the rear wall. The door has a leather handle, just visible in the picture. I guess the old farmer was quite pleased with this, but frankly I don’t see where to put the satellite TV or hook up to the Internet. The canyon features two interesting homes. 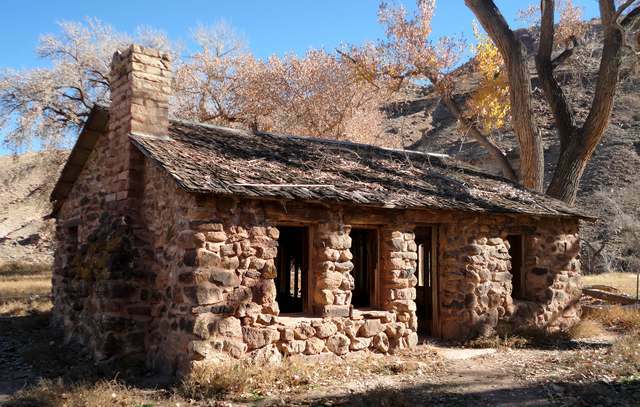 The first is the Walker Cabin, though it looks more like what even today would be a nice stone house. The Walker Cabin. See the text for the inscription on the placard out front. The home is owned by the Colorado Division of Wildlife and is open to the public. Please, please, do not tear more lathe and plaster off the walls. I’m not sure what “people” means. It could simply be the name of the person putting up the placard. Anyway, the main room features a wonderful old fireplace. The interior walls are made of 2x4s, with lathe and plaster (you have to be of a certain age to know what lathe and plaster is). The house must’ve been nice and cozy back when Harry Walker and, presumably, his family, lived there. I looked for evidence that the house was ever electrified, but found none. I have to admire the quality of the stonework. Interior of Capt Smith’s Cabin. Yes, that’s a niche large enough for the good captain to sleep. The roof has quite a few holes in it, which means that before long it will collapse completely. Perhaps the Colorado Historical Society will fix the roof so it will stand for another hundred years. 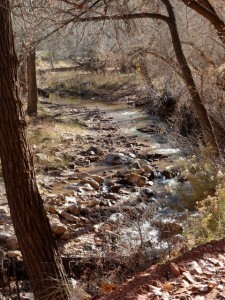 A beautiful view of Escalante Creek. All the leaves have fallen, but still it’s quite mesmerizing. There’s that word “people” again. It’s in all lower-case letters (actually small caps). If you know what this means, please leave a comment using the form below. What made me nervous about Captain Smith’s cabin was its proximity to the cliff. 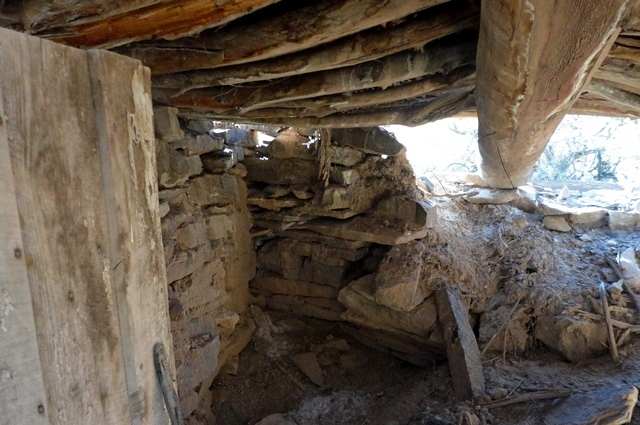 It should be obvious to the most casual observer that rocks breaks away from the cliff and tumble down, and one wall of the cabin was one of those very rocks that tumbled down, and further there were many other tumbled-down rocks everywhere. I wouldn’t be able to sleep there, fearing that the wind created by a single butterfly would cause another rock to fall on my head. But, no one asked me, so I guess he was free to build where he wanted (this was before every little town had a Planning Commission). One other thing is interesting, I thought, and that is that he featured his rank after the war. I guess it wasn’t uncommon in those days to be known by your former military rank, particularly if you were an officer, but if that’s the case, I should be signing this as Captain Casler, because that was my Air Force rank when I finished my four-year tour back in 1980. If he can be a captain post-military, so can I, at least for this paragraph! We continued onward until just short of the boundary of the Uncompahgre National Forest. We turned around not because of road conditions (the road was great) but because it was getting on into the afternoon. The sun sets rather early in mid-November, and temperatures plummet after the sun goes down, so we beat a timely retreat. My brother-in-law once told me that while traveling one should never see everything there is to see, because then there’s no reason to return. DeLorme Top North America shows that the road does in fact go all the way to Divide Road, the great north-south road that transits the entire length of the Uncompahgre Plateau. Where we turned around the road looked much less well maintained than what we’d been on, so I suspect if we had continued, we might have been very grateful to be in a RZR instead of a pickup truck or whatnot. And my thanks to my good friend Gary for driving his RZR. It’ll be my turn next time. Here are two pictures taken of the valley. It’s definitely a red rock canyon. Nice view of a ranch tucked up under a red rock cliff. Note that these ranchers, unlike Capt Smith, had the good sense to build their home somewhat away from where the rocks fall from the cliff. And here is the promised GPS map. 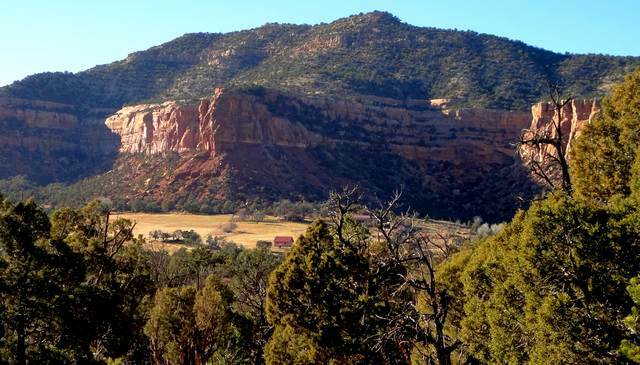 The road into Escalante Canyon is accessed from US Hwy 550, to the west of Delta, Colorado. GPS map of our little trip up Escalante Canyon, showing the side trip to the waterwheel and our trip up the road nearly to the National Forest boundary. 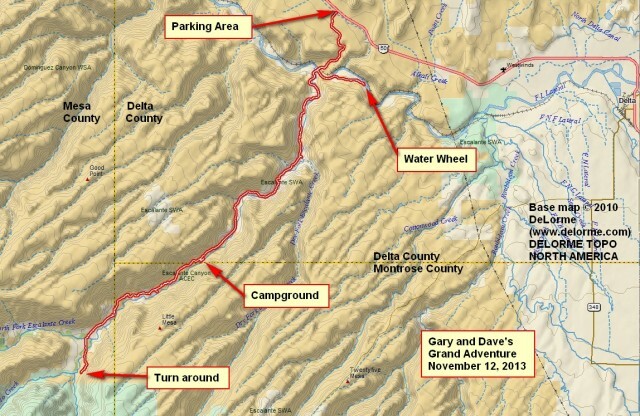 This entry was posted in All-Terrain Vehicles (ATV) and Side-by-Side, Delta County, GPS Tracks and tagged Captain Smith's Cabin, escalante expedition, Gunnison River, Harry Walker Cabin, Uncompahgre National Forest. Bookmark the permalink. Yeah, but as I recall from that period, the Viet Cong always shot at whoever was in the passenger seat! I guess it’s only fitting that a “Specialist Fourth Class” drives the “Captain” around.